This is the Acebeam L16 tactical flashlight , sent for my review from Acebeam and NO other compensation other than keeping the light that I am reviewing. This is my first Acebeam product and I would like to mention that I was impressed with the actual packaging and care taken with this light. Although the light was shipped in a DHL plastic envelope , extra care was taken to make sure there was sufficent padding (bubble wrap) to assure there was no damage to the box or light inside that envelope. Kudos to Acebeam for that little extra detail that many times we do not see from other companies. The actual box from the company is also padded inside and everything was well packaged inside that box. The Box included the L16 itself , the 3100mAh Acebeam branded cell inside the light (with the plastic insulator to prevent cell from making contact) , a nice nylon holster , charging cord , lanyard , extra o-rings , rubber switch boot , user manual and warranty card (5 year). The L16 is done with a very nice , what I would call a semi matte finish , as it is not real shiny , but not really as dull as the true matte finish either , it does have a nice appearance and feel to it though. The Knurling is a pretty agressive one but not so much that it is too rough. When you grab the L16 it just has a good grippy feeling on the knurling. There is also a clip for head down carry of this light. Personally it is just a touch big for jeans pocket but something like cargo pants or a jacket it will pocket fine. The Bezel is a silvery matte finish and it is hard for me to tell if it is stainless or aluminum , but it looks good on the light either way. The L16 has a built in USB charger with indicator light , so the included 18650 cell can be charged from that , or you can remove the cell and charge it on an external charger if desired. Unlike many of the proprietary cells , the Acebeam cell is interchangeable with other High Drain cells , meaning you can use something like the LG HE4 , Efest , Sony , or other quality cells in this light and they will charge with the built in charging system , as well as operate the light just fine. The L16 can also operate on 2 x CR123A or it is also listed as working with the protected cells. When using either the protected 18650 or the CR123A cells it should be noted the output will be less. DO NOT try to charge the CR123A cells inside this light , as the charger is only made to charge the 18650 cells. The L16 has an AR coated lens with a very nice , smooth reflector sitting under it. The lens and reflector cover a XHP 35 HI emitter on copper MCPCB that make a very nice , smooth and bright beam. At the tail end of the light is the tactical or “cigar” grip ring that gives that extra little bit to assure there is no slippage when operating the light from the tail end. The L16 has both the tail switch and the side switch, The tail switch is used for tactical purposes as it is a momentary on for the Turbo mode with a half press, or it will fully activate the Turbo mode when fully clicked. Once the Turbo mode is activated from the tail switch the side switch becomes inoperable so there is no chance of accidental mode changes. The side switch controls the rest of the modes (Firefly / Low / Medium / High / Strobe and the “Lock Out” function) Lock out is achieved by holding the side switch down from “OFF” for 3 seconds and to reverse or deactivate lockout , simply press and hold the side switch 3 seconds again. The L16 is turned on by a quick press of the side switch. Regular modes are cycled by holding the side switch down 3/4 of a second to 1 second and releasing , or once the light is turned on , you can simply hold the side switch down and cycle through the firefly / low / medium / and high modes and let go of the switch at the desired mode. Turn the light back off with a quick single click of the side switch. You can also activate the Turbo mode with the side switch if desired , with a quick double click and a quick triple click gets you into the strobe function. The strobe can be accessed from any mode with the side switch (including off) as can the Turbo mode from the side switch or tail switch from any mode. The L16 also has mode memory , memorizing the last used mode , other than Turbo or strobe. The turbo mode DOES NOT have a timer or a step down so the L16 can be turned on in Turbo and the light ran until cell depletion (until the Low Voltage Warning) which is 3 quick blinks a long pause and 3 quick blinks in cycles. The lumens will drop about mid-way to the end of the cell depletion , but the light does hold fairly high lumens for about half of the turbo cycle. Overall I have NO complaints about this light for my personal use. The overall fit , finish , feel and functionality of the L16 are all of very high standards in my opinion. Also I might mention the L16 IS NOT glued together any where (at least on the sample I got) so for the modders out there , it would make a good candidate if you did decide it needed modding. ALL testing done with the included Acebeam cell……. For those who don’t want to watch the whole video……the still shots , teardown and beamshots start at 8:22 in the timeline and the live outdoor footage comparing the Convoy L4 and modded XinTD C8 start at 14:05 of the timeline. Video followed by listed specs……….. Pretty handsome light. Thanks for the review. What would you say the approx color temp is? Thanks for the review, are you able to turn on, change modes and turn off the light by only using the side switch? Or do you have to turn it on using the tail switch and change modes with the side switch? Always glad to do the reviews. I think they had it listed as 6500K on the Amazon site. The tube of light coming out looks really cool in the beamshots and when I am using the light , but the actual light on target doesn’t look nearly as cool as that tube of light does. The light on target looks slightly warmer than the listed 6500K and is a nice pure white , (more like the cool end of neutral to me) , as far as what is hitting the target , such as the trees and animals and that kind of stuff. The tail switch only operates the Turbo mode , a half press for momentary and a full click for constant on……..the side switch controls everything else. Great review and great music as always. Glad to do the review Dale. Also glad I could be of help with you finding a light you don’t have and just REALLY want. Thanks for the review! Acebeam lights as always drives the emitter hard without nasty drops! I wish we could see more lights like this from other brands. One thing I cannot understand is the runtime on high... it puts out ~1000 lumens for more than 2 hours from a single 18650? The XHP35 has slightly better efficiency than the XP and XM emitters, but 1,000 lumens for over 2 hours with a 11Wh battery translates into more than 200lm/watt. Sounds too good to be true? As I had mentioned this is my first Acebeam light , but I do like it. The run time kind of surprised me also but I sat here with the light on and watched the clock and never left the light alone for more than a minute. As shown in the charts up there it really did run 138 minutes until the first low voltage blink. I guess they are figuring out how to make the drivers more efficient from what is there. Looked at from that perspective, a 1000 lumen 2 hour light pretty much makes it worth the money, having a Turbo boost in times of need is icing on the cake. Thanks for the review robo819! I enjoyed watching your video. Looks like a nice high quality thrower. You are probably right , may have to check that later on. YW NF…….. I was actually pleasantly surprised with the build quality of this light. I don’t think the run times were listed quiet right…….. I mean they have High listed at 1.2 hours at 1000 lumens and Turbo listed at 1.1 hours at 2000 lumens ……. Definitely something don’t compute right with that equation. I actually have another light of a different brand , I am working on a review of now and it list 2.5 hours of run time with included cell in High mode……..it went to 221 minutes , or about an hour over what is listed on it also ……Scratching my head over these long times for sure. 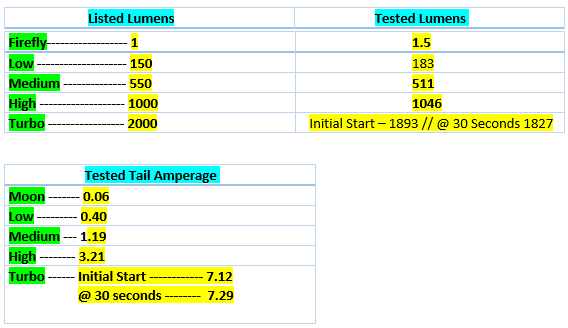 But manufacturer lists 500lumens for about 2.2 hours which are more or less your 138min on high (1000lm). Are you sure that the light didn’t stepdown from 1000 to 500 at some point? I’ll be buying one of this lights thanks for your review! I will be gone a lot of the day today , but I will do another run time test later this evening just to double check the times and lumens. OK everyone my sincere apologies for my initial report on the run time in High mode……. I am glad now that Anthon kept insisting the numbers sound wrong for my run time test……. I was going to be gone today but the plans that were in place have changed first thing this morning so I decided to try the test again. I am going to be conducting 2 or 3 more run time test after this but for the moment the numbers as far as the run time is wayyyyyyy off from my first test. I pulled the chart for the initial testing from the OP , until I can get more concrete numbers and I will update again after all the test are done. For now the run time only made it to 43 minutes , but the lumens readings stayed almost identical up to that point of the test. The low voltage warning also flashed much sooner than in the first test I did. This time the warning blink came with the cell at 3.29 volts , the first test the cell was at 3.06 volts…..the lumens at the end of the test today were at 1031 and the first test the lumens were at 993. There are some things that are making me raise an eyebrow now………. So there will no doubt be more testing going on with the included cell plus a couple of others and I will post results soon for my findings. I get the same lumens readings (or within 8 to 12 lumens) with the provided Acebeam 3100 mAh cell , the LG HG2 3000 mAH high drain and the Efest purple 3000 mAh high drain……..all the run times are within 1 to 2 minutes of each other with an average of 43 to 45 minutes with the light on High mode. EDIT #2…..I also meant to mention the Low Voltage warning (blink) is occurring at 3.2 or above with all three of the cells I tried so far in these later test , so all of them are indicating at a higher percentage of capacity remaining than what the initial test showed which was 3.06. HOW did I get what I did the first time using the same tools and the same online stop watch that was used for these test? I DONT HAVE A CLUE. Again I apologize for the first testing I did and put in my review. I am always very diligent and careful to make sure I do everything the same each time to assure accurate results. I will be even more careful in the future as I really feel bad about posting inaccuarate results in this review. Thanks for running the test again, now the runtime sounds more accordingly. However I wonder how did acebeam rate the runtime at 80 minutes when in reality it only runs for 45, maybe they’re counting the runtime after the drop? I knew it was impossible for a 11Wh cell to put out 1,000lm for 2 hours, even if the driver was 100% efficient. As a general rule to calculate runtime: a high capacity 18650 should be able to produce 1,000lm for 1hour in a modern flashlight. I always enjoy your video reviews. Keep up the good work. Cheapest I could find was from Andrew-Amanda. MAP still applies but you get the option to submit your offer and get the lowest possible price. So far I really don’t have any negatives about the light at all. I wish acebeam L16 would came in 26650 format., please. This L16 is a 2000 lumen light, and 26650 would fit perfect in this light. We can use turbo for long time.